Assertiveness research papers examine the role of assertiveness in American Culture from social scientists point of view. Twenty-five years ago, social scientists such as Alberti and Emmons carefully examined the role of assertiveness in American culture. In doing so, they discovered that “people are largely dissatisfied with the lack of influence they have on the job” . It is not only on the job, however that people are dissatisfied. Dissatisfaction can be felt in professional and personal relationships in ways that can cost jobs and marriages or can keep social interactions at a dysfunctional level. Assertiveness is one way for people to express what they want in relationships of all kinds, without hurting other people and without putting themselves at risk. By paying close attention to the behaviors and thought processes of assertiveness, one can continue to practice the behaviors and develop the ‘muscle’ of assertiveness to a satisfying level. At the same time, it is essential to understand what assertive is not: table-thumping, taking advantage of loopholes, glaring, heavy sighing, leaving nasty notes or making unreasonable demands. As mentioned above, dissatisfaction on the job is endemic in this culture. 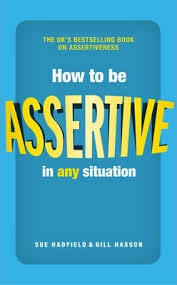 Most job environments do not reward assertiveness. Instead, they encourage—and often demand—conformity and non-assertion. The hierarchical structure of most businesses and corporations precludes one’s ability to get ahead by assertion alone. Bosses represent authority figures to most people. Thus, however one is emotionally programmed to respond to authority is likely to show up in the workplace. For example, if James was bullied by his father and older brothers throughout his growing-up years, he would be a good candidate for a cowering employee when it came to asking his supervisor for a raise, a change of venue, or some extra time off. James lacks the ability to respond to the current situation in a realistic way. Instead, he brings his past experiences and his conditioned responses into the present. James needs to check his self-talk to see what he is saying to himself about his own self-worth. His self-esteem may be at low ebb; consequently his meager assertions might be met with scorn. Paper Masters writes custom research papers on Assertiveness and examine the role of assertiveness in American Culture from social scientists point of view.